Today is World Diabetes Day (WDD). 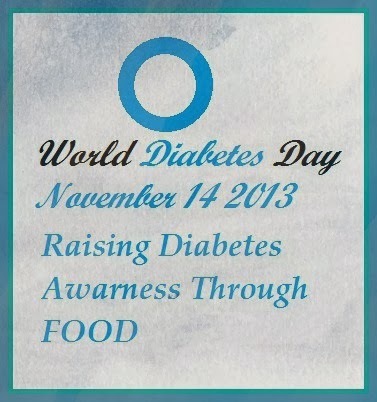 The aims of the day are to increase an awareness of the effects of diabetes and its complications among the people. It is observed on November 14 each year. Thanks to my blogger friend Swathi of Zesty SouthIndian Kitchen who asked me in the diabetic awareness campaign. I am very happy to share my experience to you all. Diabetes is classed as a metabolism disorder. It's often referred by doctor as diabetes mellitus in which the person has high blood glucose/ blood sugar either because insulin production is inadequate or the body cells do not respond properly to insulin or both. Metabolism refers to the way our bodies use digested food for energy and growth. The glucose makes its way into our bloodstream. However, glucose cannot enter our cells without insulin being present - insulin makes it possible for our cell to take the glucose. Insulin is a hormone that is produced by the pancreas. After eating the pancreas automatically releases an adequate quantity of insulin to move the glucose present in our blood into the cells, as soon as glucose enters the cells blood-glucose level drop. Millions of people live with diabetes every day all over the world. Both types of diabetes can be perfectly and efficiently controlled with medication and a change of lifestyle. My father was diagnosed with diabetes at the age of 60. He was diagnosed with type 2 diabetes to start in 2007. Family history and genes play a role in type 2 diabetes. Low activity level, poor diet and excess body weight around the waist increase your chance of getting the diseases. My mother started all the possible treatments and she consulted a doctor. Doctor prescribed some medicines to reduce his sugar level. But after all these treatments his sugar level is under control. So please all people out there, exercise a lot keep away from diabetes and the ones who are diabetic please get regular check your blood sugar level and under doctor treatment. 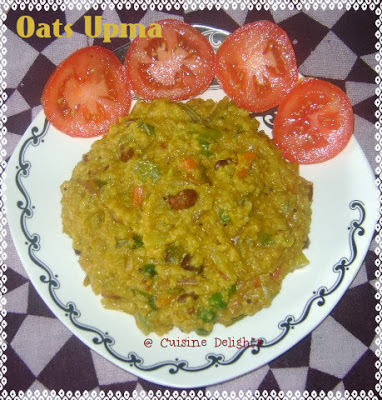 We all knows that Oatmeal is a whole grain and is high fiber which slows the absorption of glucose from food in the stomach- keeping blood sugar level under control. 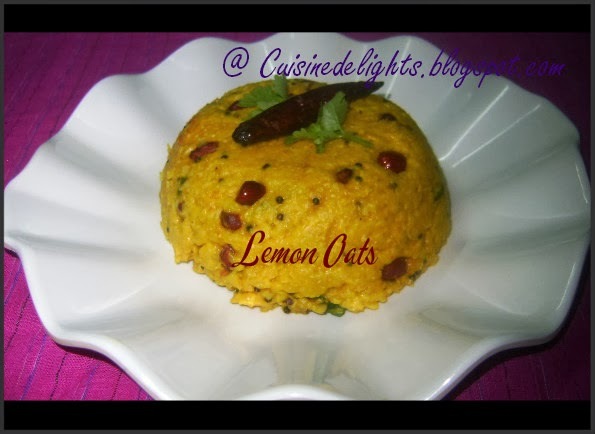 I make Lemon oats which similar to lemon rice. 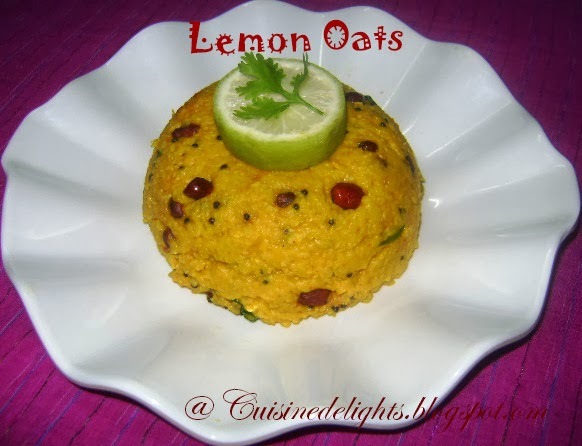 Lemon Oats is a very healthy one pot meal, with a punch of tanginess and almost less oil. Dry roast peanuts for 5-7 minutes on low flame. Keep aside. Heat a pan with oil add seasoning ingredients when seeds splutter then add turmeric powder, water, lemon juice, salt and bring to boil. Now add oats, water and mix well. Reduce the flame and close the lid. Cook for 3-4 minutes. Remove the lid and add roasted peanuts. 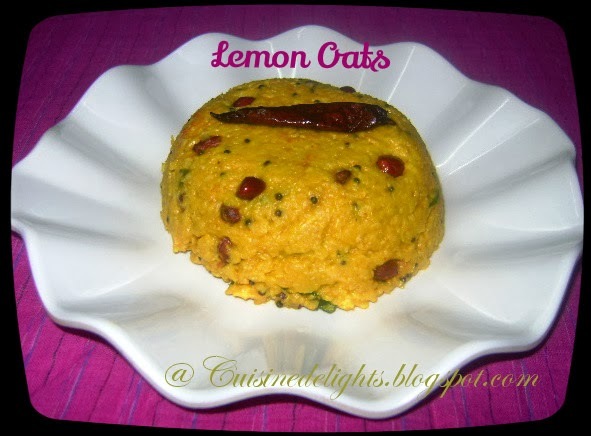 Serve hot with coriander leaves and lemon wedge.